Inlet Villas is a North Myrtle Beach resort that beautifully sits right on the salt marsh inlet and is just across the street from the Atlantic Ocean. This North Myrtle Beach resort is in the popular Cherry Grove section of North Myrtle Beach, South Carolina and is at the very northern point of the Cherry Grove peninsula. Easy to find from Highway 17, Inlet Villas is a North Myrtle Beach vacation destination that gives you the best of two worlds: the exciting Atlantic Ocean and gorgeous white sandy beaches where the sunrises are phenomenal, and the peaceful and tranquil salt marsh where the sunsets are divine. Bring your family to Inlet Villas where two-bedroom North Myrtle Beach vacation rentals accommodate up to six people. This mid-size North Myrtle Beach resort is just three stories high and has a stairway on both ends so you can quickly get from your car in the parking lot to your tastefully decorated North Myrtle Beach condominium. Each of the North Myrtle Beach rentals at Inlet Villas features a private balcony with either inlet views or ocean views. The sparkling blue swimming pool at this North Myrtle Beach resort is practically over the marsh. What a restful place to lounge. Slip into the swimming pool for a nice dip or stretch out poolside and listen to the marsh grasses rustle as the gentle wind blows. The Atlantic Ocean is right across the street from this North Myrtle Beach resort so you can go for a walk on the beach or stretch out on a beach chair for the afternoon during your North Myrtle Beach vacation at Inlet Villas. The North Myrtle Beach vacation rentals at Inlet Villas are spacious and beautiful. Filled with fantastic amenities and all the modern conveniences of home, these condos in North Myrtle Beach, South Carolina are quite comfortable. Take advantage of the washing machine and clothes dryer found in these North Myrtle Beach rentals. The kitchen of each of these North Myrtle Beach condo rentals is wonderfully furnished with cookware, dishes and utensils. Keep your drinks nice and cold in the refrigerator and with a stove and an oven you can make any kind of meal you want during your North Myrtle Beach vacation. There is even a dishwasher in these North Myrtle Beach vacation rentals to help make clean up a breeze because the last thing you want to have to do during your North Myrtle Beach vacation is wash dishes! 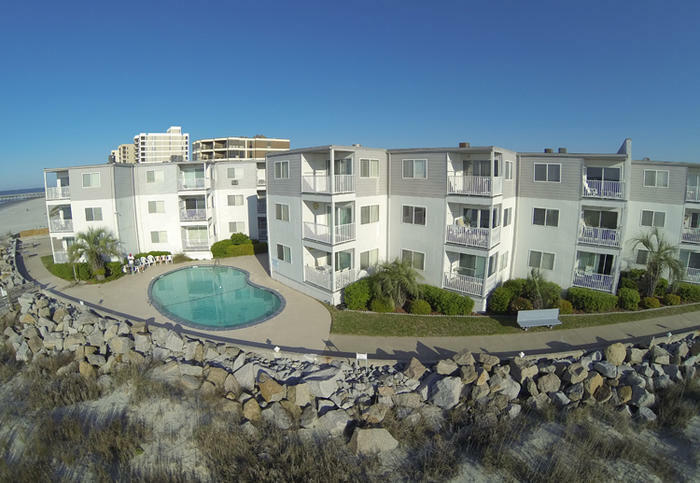 There is a microwave in these North Myrtle Beach condos and with at least one DVD player in each of these condos in North Myrtle Beach, South Carolina your family can have a movie night with popcorn during your North Myrtle Beach vacation at this North Myrtle Beach resort. Elliott Beach Rentals is not affiliated with onsite management or the HOA of Inlet Villas.